FATAL AND NONFATAL PANCREATITIS HAVE OCCURRED DURING THERAPY WHEN ZERIT WAS PART OF A COMBINATION REGIMEN THAT INCLUDED DIDANOSINE IN BOTH TREATMENT-NAIVE AND TREATMENT-EXPERIENCED PATIENTS, REGARDLESS OF DEGREE OF IMMUNOSUPPRESSION (SEE WARNINGS). ZERIT (stavudine) Capsules are supplied for oral administration in strengths of 15, 20, 30, and 40 mg of stavudine. Each capsule also contains inactive ingredients microcrystalline cellulose, sodium starch glycolate, lactose, and magnesium stearate. The hard gelatin shell consists of gelatin, titanium dioxide, and iron oxides. The capsules are printed with edible inks. The cell culture antiviral activity of stavudine was measured in peripheral blood mononuclear cells, monocytic cells, and lymphoblastoid cell lines. The concentration of drug necessary to inhibit HIV-1 replication by 50% (EC50) ranged from 0.009 to 4 µM against laboratory and clinical isolates of HIV-1. In cell culture, stavudine exhibited additive to antagonistic activity in combination with zidovudine. Stavudine in combination with either abacavir, didanosine, tenofovir, or zalcitabine exhibited additive to synergistic anti-HIV-1 activity. Ribavirin, at the 9â€‘45 µM concentrations tested, reduced the anti-HIV-1 activity of stavudine by 2.5- to 5-fold. The relationship between cell culture susceptibility of HIV-1 to stavudine and the inhibition of HIV-1 replication in humans has not been established. HIV-1 isolates with reduced susceptibility to stavudine have been selected in cell culture (strain-specific) and were also obtained from patients treated with stavudine. Phenotypic analysis of HIV-1 isolates from 61 patients receiving prolonged (6-29 months) stavudine monotherapy showed that post-therapy isolates from four patients exhibited EC50 values more than 4-fold (range 7- to 16-fold) higher than the average pretreatment susceptibility of baseline isolates. Of these, HIV-1 isolates from one patient contained the zidovudine-resistance-associated mutations T215Y and K219E, and isolates from another patient contained the multiple-nucleoside-resistance-associated mutation Q151M. Mutations in the RT gene of HIV-1 isolates from the other two patients were not detected. The genetic basis for stavudine susceptibility changes has not been identified. Cross-resistance among HIV-1 reverse transcriptase inhibitors has been observed. Several studies have demonstrated that prolonged stavudine treatment can select and/or maintain mutations associated with zidovudine resistance. HIV-1 isolates with one or more zidovudine-resistance-associated mutations (M41L, D67N, K70R, L210W, T215Y/F, K219Q/E) exhibited reduced susceptibility to stavudine in cell culture. Following oral administration, stavudine is rapidly absorbed, with peak plasma concentrations occurring within 1 hour after dosing. The systemic exposure to stavudine is the same following administration as capsules or solution. Steady-state pharmacokinetic parameters of ZERIT (stavudine) in HIV-infected adults are shown in Table 1.
a from 0 to 24 hours. In HIV-infected patients, renal elimination of unchanged drug accounts for about 40% of the overall clearance regardless of the route of administration (Table 2). The mean renal clearance was about twice the average endogenous creatinine clearance, indicating active tubular secretion in addition to glomerular filtration. b at median time of 2.5 hours (range 2-3 hours) following multiple oral doses. The efficacy of ZERIT was demonstrated in a randomized, double-blind study (AI455-019, conducted 1992-1994) comparing ZERIT with zidovudine in 822 patients with a spectrum of HIV-related symptoms. The outcome in terms of progression of HIV disease and death was similar for both drugs. Treatment with ZERIT (stavudine) should be suspended in any patient who develops clinical or laboratory findings suggestive of symptomatic hyperlactatemia, lactic acidosis, or pronounced hepatotoxicity (which may include hepatomegaly and steatosis even in the absence of marked transaminase elevations). 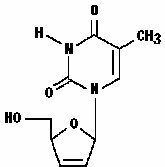 In vitro studies have shown ribavirin can reduce the phosphorylation of pyrimidine nucleoside analogues such as stavudine. Although no evidence of a pharmacokinetic or pharmacodynamic (eg, loss of HIV/HCV virologic suppression) interaction was seen when ribavirin was coadministered with stavudine in HIV/HCV co-infected patients (see CLINICAL PHARMACOLOGY: Drug Interactions), hepatic decompensation (some fatal) has occurred in HIV/HCV co-infected patients receiving combination antiretroviral therapy for HIV and interferon and ribavirin. Patients receiving interferon with or without ribavirin and stavudine should be closely monitored for treatment-associated toxicities, especially hepatic decompensation. Discontinuation of stavudine should be considered as medically appropriate. Dose reduction or discontinuation of interferon, ribavirin, or both should also be considered if worsening clinical toxicities are observed, including hepatic decompensation (eg, Child-Pugh >6) (see the complete prescribing information for interferon and ribavirin). Fatal and nonfatal pancreatitis have occurred during therapy when ZERIT was part of a combination regimen that included didanosine in both treatment-naive and treatment-experienced patients, regardless of degree of immunosuppression. The combination of ZERIT and didanosine and any other agents that are toxic to the pancreas should be suspended in patients with suspected pancreatitis. Reinstitution of ZERIT after a confirmed diagnosis of pancreatitis should be undertaken with particular caution and close patient monitoring. The new regimen should not contain didanosine. Patients should be informed that when ZERIT is used in combination with other agents with similar toxicities, the incidence of adverse events may be higher than when ZERIT is used alone. An increased risk of pancreatitis, which may be fatal, may occur in patients treated with the combination of ZERIT and didanosine. Patients treated with this combination should be closely monitored for symptoms of pancreatitis. An increased risk of hepatotoxicity, which may be fatal, may occur in patients treated with ZERIT in combination with didanosine and hydroxyurea. This combination should be avoided. Reproduction studies have been performed in rats and rabbits with exposures (based on Cmax) up to 399 and 183 times, respectively, of that seen at a clinical dosage of 1 mg/kg/day and have revealed no evidence of teratogenicity. The incidence in fetuses of a common skeletal variation, unossified or incomplete ossification of sternebra, was increased in rats at 399 times human exposure, while no effect was observed at 216 times human exposure. A slight post-implantation loss was noted at 216 times the human exposure with no effect noted at approximately 135 times the human exposure. An increase in early rat neonatal mortality (birth to 4 days of age) occurred at 399 times the human exposure, while survival of neonates was unaffected at approximately 135 times the human exposure. A study in rats showed that stavudine is transferred to the fetus through the placenta. The concentration in fetal tissue was approximately one-half the concentration in maternal plasma. Animal reproduction studies are not always predictive of human response. Fatal lactic acidosis has been reported in pregnant women who received the combination of stavudine and didanosine with other antiretroviral agents. It is unclear if pregnancy augments the risk of lactic acidosis/hepatic steatosis syndrome reported in nonpregnant individuals receiving nucleoside analogues (see WARNINGS: Lactic Acidosis/Severe Hepatomegaly with Steatosis). The combination of stavudine and didanosine should be used with caution during pregnancy and is recommended only if the potential benefit clearly outweighs the potential risk. Healthcare providers caring for HIV-infected pregnant women receiving stavudine should be alert for early diagnosis of lactic acidosis/hepatic steatosis syndrome. ZERIT therapy has also been associated with peripheral sensory neuropathy, which can be severe, is dose related, and occurs more frequently in patients being treated with other drugs that have been associated with neuropathy (including didanosine), in patients with advanced HIV infection, or in patients who have previously experienced peripheral neuropathy. Selected clinical adverse events that occurred in antiretroviral-naive adult patients receiving ZERIT from two controlled combination studies are provided in Table 8.
a Any severity, regardless of relationship to study regimen. Pancreatitis resulting in death was observed in patients treated with ZERIT plus didanosine in controlled clinical studies and in postmarketing reports. Selected laboratory abnormalities reported in a controlled monotherapy study (Study AI455â€‘019) are provided in Table 9. Body as a Wholeâ€”abdominal pain, allergic reaction, chills/fever, and redistribution/accumulation of body fat (see PRECAUTIONS: Fat Redistribution). Exocrine Gland Disordersâ€”pancreatitis [including fatal cases (see WARNINGS)]. Hematologic Disordersâ€”anemia, leukopenia, thrombocytopenia, and macrocytosis. Liverâ€”symptomatic hyperlactatemia/lactic acidosis and hepatic steatosis (see WARNINGS), hepatitis and liver failure. Metabolic Disordersâ€”diabetes mellitus and hyperglycemia. Nervous Systemâ€”insomnia, severe motor weakness (most often reported in the setting of lactic acidosis, see WARNINGS). When stavudine is used in combination with other agents with similar toxicities, the incidence of these toxicities may be higher than when stavudine is used alone. Thus, patients treated with ZERIT in combination with didanosine, with or without hydroxyurea, may be at increased risk for pancreatitis and hepatotoxicity, which may be fatal, and severe peripheral neuropathy. The combination of ZERIT and hydroxyurea, with or without didanosine, should be avoided (see WARNINGS and PRECAUTIONS). 40 mg twice daily for patients â‰¥60 kg. Pediatrics: The recommended dose for newborns from birth to 13 days old is 0.5 mg/kg/dose given every 12 hours (see CLINICAL PHARMACOLOGY). The recommended dose for pediatric patients at least 14 days old and weighing less than 30 kg is 1 mg/kg/dose, given every 12 hours. Pediatric patients weighing 30 kg or greater should receive the recommended adult dosage. 20 mg twice daily for patients â‰¥60 kg. The recommended dose is 20 mg every 24 hours (â‰¥60 kg) or 15 mg every 24 hours (<60 kg), administered after the completion of hemodialysis and at the same time of day on non-dialysis days. Dispense solution in original container with measuring cup provided. Instruct patient to shake the container vigorously prior to measuring each dose and to store the tightly closed container in a refrigerator, 2° C to 8° C (36° F to 46° F). Discard any unused portion after 30 days. ZERIT for Oral Solution should be protected from excessive moisture and stored in tightly closed containers at 25° C (77° F). Excursions between 15° C and 30° C (59° F and 86° F) are permitted (see USP Controlled Room Temperature). After constitution, store tightly closed containers of ZERIT for Oral Solution in a refrigerator, 2° C to 8° C (36° F to 46° F). Discard any unused portion after 30 days. 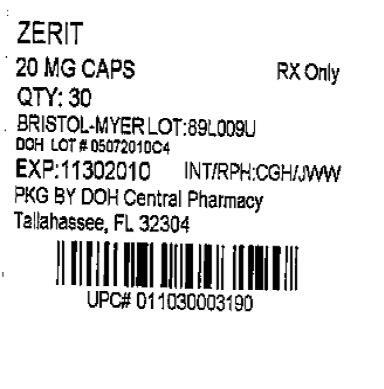 ZERIT (pronounced ZAIR it ) is a prescription medicine used in combination with other drugs to treat adults and children who are infected with HIV (the human immunodeficiency virus), the virus that causes AIDS. 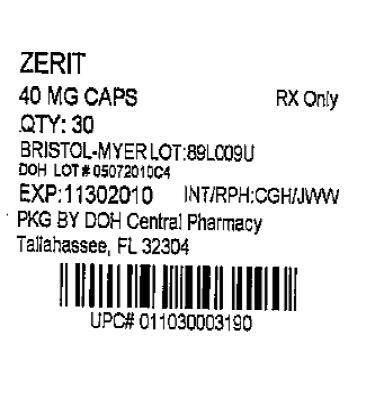 ZERIT belongs to a class of drugs called nucleoside reverse transcriptase inhibitors (NRTIs). By reducing the growth of HIV, ZERIT helps your body maintain its supply of CD4 cells, which are important for fighting HIV and other infections. ZERIT (stavudine) will not cure your HIV infection. At present there is no cure for HIV infection. Even while taking ZERIT, you may continue to have HIV-related illnesses, including infections caused by other disease-producing organisms. Continue to see your doctor regularly and report any medical problems that occur. If your kidneys are not working properly, your doctor may monitor your kidney function while you take ZERIT. Also, your dosage of ZERIT may be adjusted. If you notice these symptoms or if your medical condition has suddenly changed, stop taking ZERIT and call your doctor right away. Lactic acidosis is a medical emergency that must be treated in a hospital. Women (including pregnant women), overweight patients, and those who have had lengthy treatment with nucleoside medicines are more likely to develop lactic acidosis. Your doctor should closely monitor your liver function if you are taking ZERIT and have a history of heavy alcohol use or a liver condition. Pancreatitis is a dangerous inflammation of the pancreas. It may cause death. Tell your doctor right away if you develop stomach pain, nausea, or vomiting. These can be signs of pancreatitis. Let your doctor know if you have ever had pancreatitis, regularly drink alcoholic beverages, or have gallstones. Pancreatitis occurs more often in patients with these conditions. It is also more likely in people with advanced HIV disease, but can occur at any disease stage. The combination of ZERIT and didanosine may increase your risk for pancreatitis. People who take ZERIT along with other medicines that may cause similar side effects may have a higher chance of developing these side effects than if they took ZERIT (stavudine) alone. Other side effects. 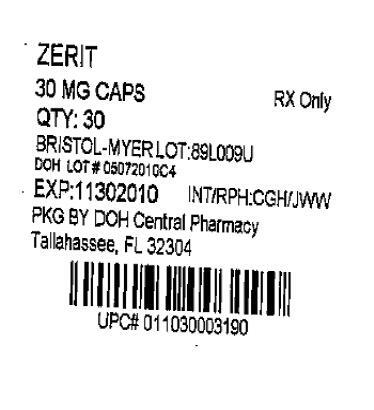 In addition to peripheral neuropathy, the most frequent side effects observed in studies of adults taking the recommended dose of ZERIT were headache, diarrhea, rash, nausea, and vomiting. Other side effects may include abdominal pain, muscle pain, insomnia, loss of appetite, chills or fever, allergic reactions, blood disorders, and high blood sugar (hyperglycemia or diabetes). Changes in body fat have been seen in some patients taking antiretroviral therapy. These changes may include increased amount of fat in the upper back and neck (â€œbuffalo humpâ€), breast, and around the trunk. Loss of fat from the legs, arms, and face may also happen. The cause and long-term health effects of these conditions are not known at this time. This medicine was prescribed for your particular condition. Do not use ZERIT for another condition or give it to others. Keep ZERIT and all other medicines out of the reach of children and pets at all times. Do not keep medicine that is out of date or that you no longer need. Dispose of unused ZERIT through community take-back disposal programs when available or by placing it in an unrecognizable closed container in the household trash.